The workforce of the future is already here: are you ready? While there is no crystal ball, staying intellectually curious, confident in your skill set and willing to stay informed on new emerging trends will help ensure that your future stays bright. The age of automation—long talked about as a thing of the future—has already arrived, and it’s here to stay. Emerging technologies like IoT, AI and machine learning are seeing rapid adoption, and existing technologies like big data analytics and the cloud are becoming firmly embedded in the way we do business. But this fundamental shift in how and where we use intelligent technology is only the beginning. We should expect exponential growth and turnover within the next 10 to 15 years, where new technologies will continue to change nearly every aspect of our lives, from the houses we live in, to the devices we interact with, and perhaps most importantly, how we work. As more young generations join the workforce as digital natives, they bring with them a born skillset to thrive and operate in a completely digital environment. In order to stay competitive, relevant and productive, that means the rest of us need to ensure we’re digitally fluent and ready for the next big wave of technology… and the ones after that. If we fast forward to the next 20 years, how will applications of AI, machine learning and others we haven’t yet realized change how we work? What skills will this new “ultra-digital” workforce need to succeed and compete? And what kinds of jobs will emerge? Only time will tell – but if we don’t prepare now, some of us could be left behind. If you’ve read about AI and machine learning lately, chances are you’ve seen this issue hotly debated: Will robots (eventually) take my job? Recently, I gave a presentation where I showed a slide of a very sleek robot carrying a tray of red wine. While we’re not likely to see this instance in a restaurant just yet, it does beg the question: When will we? And are job losses a possibility? Although the tech we’re referencing may be new, these concerns and questions are not. Think back to the industrial revolution, when horses gave way to the Model T, radio inspired the television, and the typewriter paved the way for the computer. The point is, human beings adapt. They have and want purpose, so they find new jobs, explore new skills, and find new ways to earn a living. That’s not unlike what will happen in this next wave of innovation. 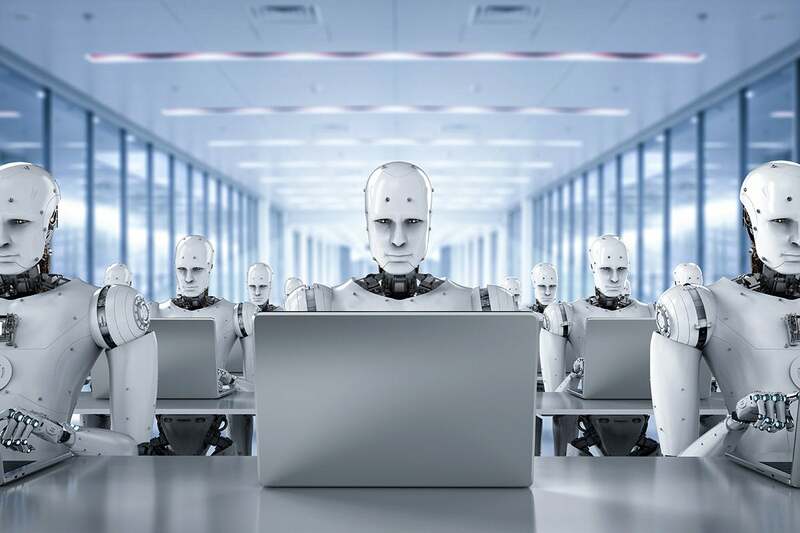 According to research by management consultants McKinsey and Company, fewer than 5 percent of occupations today can be entirely automated by existing technology. The reason? Our jobs are simply too varied and changeable for robots to take on all required tasks. While there may be some fields that see job loss due to automation (like store clerks, bank tellers and fast food workers, for instance), there is also massive potential for job gains—some in new and increasingly important fields like engineering and artificial intelligence, and others in more traditional roles, specifically those that focus on caring for, or helping, people (like teaching or nursing). Automation is a double-edged sword: Some jobs could become obsolete, but there is also massive upside when eliminating monotonous, repeated tasks and freeing up time for workers to do more meaningful work. As the amount of data continues to swell, technical savvy and computational thinking are clear and obvious skillsets that are already in high demand today. But if you’re not a computer science pro, have no fear. There’s going to be an increasingly important premium on those “right brain” skills like social and emotional intelligence and new media literacy for one big reason – robots aren’t good at them. The robot from my recent talk may be able to skate across a busy restaurant floor to deliver your glass of Pinot, but it’s not likely to pick up on social cues, or have meaningful, connected conversations any time soon. In other words, AI/ML technologies today have difficulty performing tasks that require creative intelligence, natural language, high-touch care or social acuity, which means Jobs like business development, sales, retail, fashion, entrepreneurship and communications very much depend on a human’s “touch” to be effective. The days when you graduated from high school, went to college and learned enough in four years to last a career are over. Now, and for the foreseeable future, it is more important than ever to take a lifelong approach to learning. A new study published by the Harvard Business Review found that only 20 percent of today’s workforce have the skills they’ll need for 60 percent of the jobs that will exist in the next five to 10 years. It’s safe to say there’s a lot of learning in store for all of us. And while technology is certainly fueling this skills gap, it may also be the biggest part of the solution when it comes to training for higher-skilled jobs. Many companies are already using sophisticated software, big data, mobile apps, and even AI to train and develop workers so they stay relevant, highly skilled, and productive. For example, two-day classroom training courses can now be condensed into short videos you can watch on your iPhone. Also, as a result of alternative avenues of learning like Udemy, Coursera and university funded MOOC’s (massive open online courses) gaining in popularity, it is literally easier than ever before to learn on the go. Ultimately, while there is no crystal ball, staying intellectually curious, confident in your skillset and willing to stay informed on new emerging trends will help ensure that your future stays bright, regardless of what 2030 looks like. Rachel Barger is Regional Vice President for the Southeast at SAP, responsible for license sales and customer success for Large Enterprises within the region. She has over 16 years of experience in the software industry holding a variety of leadership roles with Enterprise Sales, Customer Success and Professional Services. She additionally brings a global understanding and approach gained through her time spent managing teams in Asia and Europe.